Though Slum Village have gone through many lineup changes since their inception in 1996, the group's music has stayed powerful. Last year's studio release Evolution featured founding member T3 and newcomer Illa J (Brother of the late J Dilla, and founding member of Slum Village) atop a bevy of fresh beats from producer Young RJ, and remaining strong as ever. Evolution has set the stage for their next upcoming release, this summer's YES, following a 12-city tour in celebration of the life of their revered producer. To tide over the hunger of J Dilla-fanatics, Ne'Astra Music Group now presents the Vintage EP, a 10-track record featuring upcoming tracks from YES. Though Vintage is technically an EP, it’s not to be under-estimated. 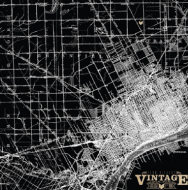 Slum Village come full force on Vintage, backed by some premium grade beats (Including a few tracks built around long-lost Dilla beats) with instrumentals as a B-Side. Guest appearances from fellow Detroit MCs Black Milk & Frank Nitt, and up-and-coming rapper Kameron Corvet further bolster the Vintage EP's potency. A preview of great things to come from Slum Village, and yet another testament to Dilla's far-reaching legend.